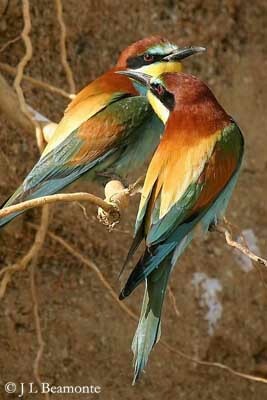 European Bee-eater is a beautiful and elegant bird similar to a rainbow when flying. Summer visitor in southern Europe, this lovely species is a sight for sore eyes! Adult male in breeding plumage has bright chestnut crown and mantle. Scapulars and rump are pale yellowish. Tail and steamers are green, as the long uppertail coverts. On the underparts, throat is yellow, bordered by black gorget. Rest of underparts is green-blue. Underwing and undertail are greyish-white. On the head, the upper bill’s base is white. Forehead is greenish-blue. Crown is dark chestnut. Lores are black, extending through the eye and to ear-coverts in black band, slightly bordered with pale greenish-blue. The strong, pointed black bill is slightly down curved. Eyes are deep red. Short legs and feet are grey-brown. Male in eclipse (autumn) is greener. Crown, gorget and scapulars are tinged green, and mantle, back and rump are green. Non-breeding plumage in male is duller than breeding. Female has greener scapulars and lower back, less yellow than male. Wings are duller and underparts are paler. The steamers are shorter too. Juvenile is paler than adults and has brown eyes. 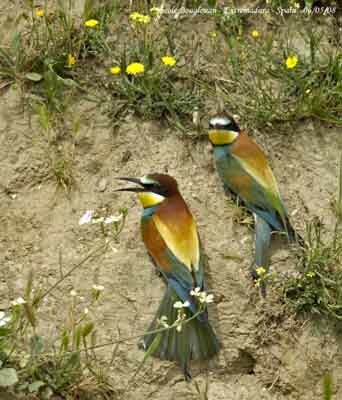 European Bee-eater is a vocal species, often calling when foraging or migrating. At the nest-burrow, the sounds are softer. Contact call is pleasant, a rolling, far-carrying “prruip” or “pruuk”. In some calls, a good ear may reveal very subtle inflections, even they are simply structured. European Bee-eater on breeding areas frequents river valleys, pastures, cultivated areas with some trees, meadows and plains, hillsides, riverbanks with shrub in semi-desert, and also corn-oak and olive-tree plantations, ricefields and cereal crops. In Africa, on their wintering areas, these birds frequent savannahs, lake shores and cultivated areas. 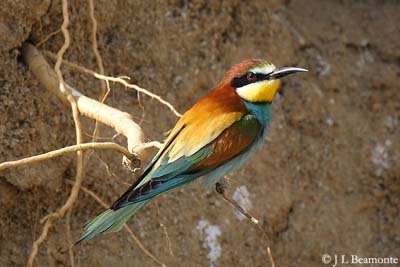 European Bee-eater breeds in Southern Europe, North and South Africa and Western Asia. This species is strongly migratory and winters in Tropical Africa, India and Sri Lanka. 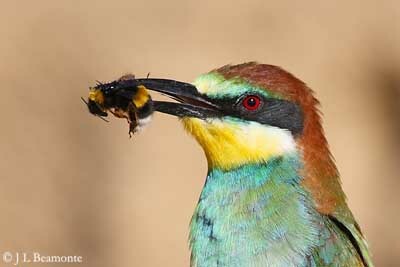 European Bee-eater feeds primarily on bees, wasps, hornets and similar species. It catches them on the wing, performing sallies from exposed perches. 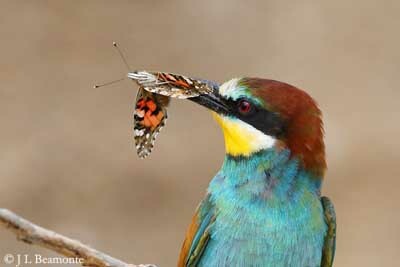 Before swallowing the prey, the bee-eater strikes it against a hard surface in order to remove the sting. One single bird may eat up to 250 bees per day. 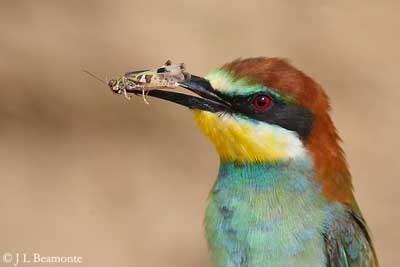 European Bee-eater also catches other insects such as dragonflies, butterflies, cicadas, termites and grasshoppers. The prey is caught after a short chase in flight from tree, wire or fence, and brought back to the perch to devenom it. The bird frequently regurgitates pellets containing the indigestible parts of the insects. 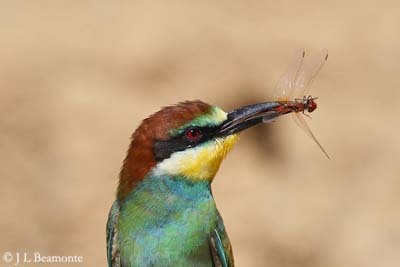 European Bee-eater needs to perform water and dust-bathing, because its skin is often infested by ectoparasites, due to the hole-nesting habits. 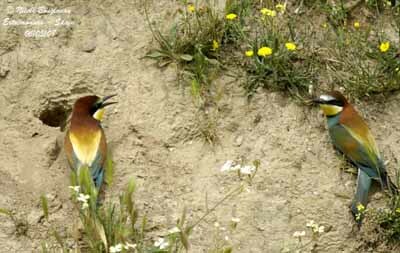 At the beginning of the breeding season, the European Bee-eater performs some displays which enhance the bright colours of the plumage. Pairs are formed on the wintering areas. Vocal display takes large part in courtship. Crown and neck feathers are erected, the quivering tail is fanned and the wings are raised while the bird is calling. The male also performs courtship feeding to female, soon after the birds arrive on breeding grounds. Copulation may follow this behaviour, but after several offers. Aerial displays consist in butterfly-like flights, with high-winged glides followed by shallow wing-beats, while the male is strongly calling. Several postures are adopted by both mates perched facing each other, such as raised wings, erect crest feathers into a point, up and down bobbing of the body, as prelude to copulation. European Bee-eater has an agile flight. Its long, fairly broad and pointed wings allow it to fly long-distances when migrating, travelling up to 500 km in one day. This bird shows great mobility when hunting, performing sallies from high perches, or feeding in continuous flight high in the air. Usually, it performs graceful wing-beats alternated with sudden acceleration on outstretched wings. 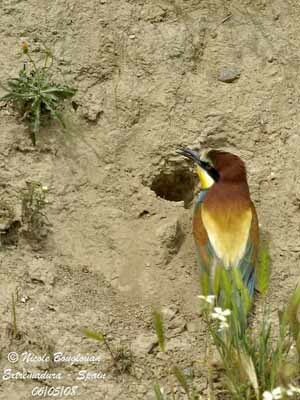 European Bee-eater usually nests in loose colonies, and sometimes alone. Soon after the birds arrive on the breeding grounds, the pair, often with some helpers, excavates the burrow at the male’s natal site. The nest is made in flat or sloping sandy ground, mainly in earthen cliffs. 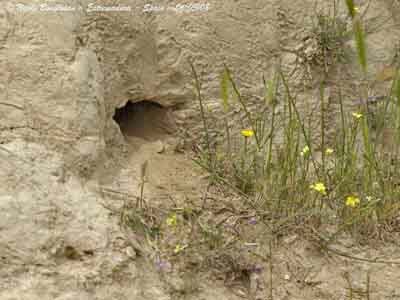 The birds remove between 7 and 12 kg of earth from the burrow, and the process can last between 10 and 20 days. The burrow is about 70-150 cm long, with oval section of 7 x 9 cm. It may be straight or slightly curved, often horizontal, but sometimes inclining in cliffs. Female lays 4-10 eggs at 1-2 days intervals. Incubation lasts 20 days, sometimes more in Palaearctic, but only 13 days in South Africa. Both sexes incubate and take turns, from 10 to 60 minutes in Palaearctic, to 2-3 hours in South Africa. The chicks hatch over 2-6 days. They are naked and blind, but the juvenile feathers grow later. At this moment, they can see and move, and they become aggressive. They are fed by both adults and some helpers. They reach the adult weight at 15-17 days for 55 grams, and at 20-25 days for 60-70 grams. Parents feed them for about three weeks more after fledging. They leave the nest about one month after hatching. A second clutch may be laid if the first is lost, and usually a second burrow is dug too. European Bee-eater feeds mainly on insects such as Hymenoptera, Diptera and Odonata, and also termites, butterflies and grasshoppers. It hunts while flying, or by sallies from exposed perches. The bees, wasps, hornets and similar species are killed by striking against a hard surface to remove the sting. 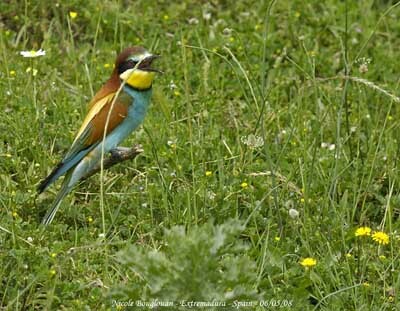 European Bee-eater is locally common and widespread in most parts of the range. However, this species is threatened by hunting as pest or for consumption, by the use of pesticides involving heavy declines in insects’ populations, also by canalization of rivers with loss of sandy banks nesting-sites, and human developments and disturbances. But this species is considered as Least Concern at this moment.